Can I board the Beantown Trolley at any location? Yes, you can begin your trolley tour at any of the 17 stops. Is there a limit to how many times I can re-board the trolley? No, you can re-board the trolley as many times as you like throughout the day. Check with your driver for the last re-boarding time of the day. Does the trolley operate every day? Yes, trolleys operate seven days a week, excluding Christmas and Thanksgiving. Do I have to take my free harbor cruise the same day as my trolley tour? No, you can take the harbor cruise any day. What do I do if the free harbor cruise is not operating? We have an free admission to the Mapparium as an alternative to the harbor cruise. Located at the Mary Baker Eddy Library, the Mapparium is a walk through glass globe of the world. Either admission is “free” and has no refundable value. Do you accept the Go Boston card? 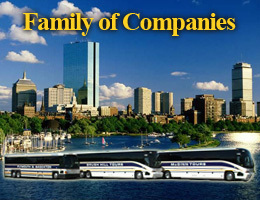 Yes, we are one of the attractions on the Go Boston card. With each card you receive a two -day trolley pass. Tickets must be redeemed at one of the three following ticket locations: New England Aquarium, Prudential Center or the Massachusetts Transportation Building. Do I have to use my two- day trolley pass on consecutive days? Yes, you must use your two-day trolley pass on two consecutive days. Where do the Gray Line Sightseeing bus tours depart? All tours depart from the Massachusetts Transportation Building. Our Gray Line Tour office is located inside at the City Place Food Court. The address is 8 Park Plaza, Boston Ma. What time do the Gray Line Sightseeing bus tours depart? Do you pick up at hotels? Yes, we offer complimentary pickups at downtown area hotels as well as hotels in the greater Boston suburban area.